Trees can create lasting impression on how a community is perceived by visitors and affect the mood and community pride of its residents. People walk and jog more on streets with trees; children and adults have a cool place to play or relax in the summer, thus increasing their interaction with neighbors. Trees can serve as a living legacy for the next generation - thus linking us to near and distant generations. Trees along rivers, streams and lakes reduce water temeratuers by their shade, prevent or reduce bank erosion and silt, and provide hiding places for improving fisheries habitat. Trees help cool the city by up to 10°F, by shading our homes and streets, breaking up urban "heat islands" and releasing water vapor into the air through their leaves. Trees in urban parks and recreation areas are estimated to improve outdoor leisure and recreation experiences in the United States by $2 billion per year. Apartments and offices in wooded areas rent quicker and have a higher occupancy rate; workers in offices in wooded areas report more productivity and less absenteeism. A study found 7% higher rental rates for commercial offices having high quality landscapes. Shoppers will travel further and longer to visit a district with high quality trees, and spend more time there once they arrive. Hospital patients recovering from surgery who had a view of a grove of trees through their windows required fewer pain relievers, experienced fewer complications, and left the hospital sooner than similar patients who had a view of a brick wall12. 2)Foster, Josh, Ashley Lowe, and Steve Winkelman. The Value of Green Infrastructure for Urban Climate Adaptation. Rep. Center for Clean Air Policy, 2011. Web. "http://www.ccap.org/docs/resources/989/Green_Infrastructure_FINAL.pdf". 5) Nowak, D.J. ; Crane, D.E. ; Dwyer, J.F. 2002. 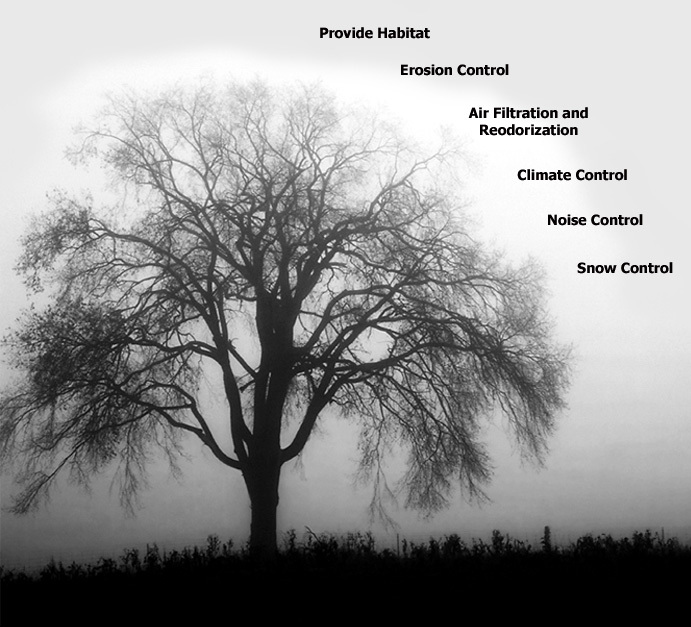 “Compensatory value of urban trees in the United States.” Journal of Arboriculture. 28(4): 194-199. 9)Parsons, R.; Tassinary, L.G. ; Ulrich, R.S. ; Hebl, M.R. ; Grossman-Alexander, M. 1998. The View From the Road: Implications for Stress Recovery and Immunization. Journal of Environmental Psychology 18(2). 10)Kaplan, R.; Kaplan, S. 1989. The Experience of Nature: A Psychological Perspective. Cambridge, MA: Cambridge University Press. 12) Ulrich, R. 1984. View through Window May Influence Recovery from Surgery 224. Ulrich, R.S. 1985. Human Responses to Vegetation and Landscapes. Landscape and Urban Planning 13. 13) Taylor, A.F. ; Kuo, F.; Sullivan,W. 2001. Coping with ADD: The Surprising Connection to Green Play Settings. Environment and Behavior 33(1). 14) Kuo, F.; Sullivan,W. 2001. Environment and Crime in the Inner City: Does Vegetation Reduce Crime? Environment and Behavior 33(3).